War veteran Larry Richardson has had only two great loves in his life, his wife Barbara and the Golden Gate Bridge, which he has dreamed of visiting since he was a senior at Derby High School, in 1967. ”I proposed to Barbara over the phone after we’d had one date,” Larry told the Derby Informer. ”I was a senior in high school and she was a sophomore. I don’t think she believed I was serious.” But he also told her to wait until he got a chance to see the Golden Gate Bridge he was so fascinated by. It didn’t take very long, as he drove over the great American landmark in February of 1968, on his way to Vietnam, for a tour duty. It was dark outside, and although he had fulfilled his dream of seeing it in person, he remembers wishing he got a chance to walk on it for a bit and admiring all the details. A year later, he got back from the war and married his Barbara in the same month she graduated from high school. 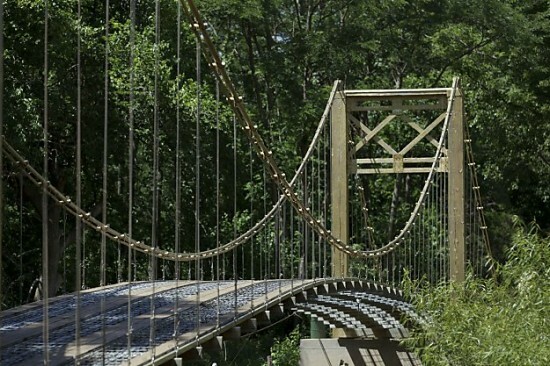 But the Golden Gate Bridge was still on his mind, so in 1994, he decided to build it across a small creek separating the largest part of his Kansas farm from a small piece of land covered with poison ivy and full of mosquitoes. Larry and his father only had a postcard of the landmark as reference. “We called it comparison engineering,” he remembers. “We said, ‘Let’s see, it is supposed to look like this.’” It took them 11 years to finish the backyard project, but the 62-year-old says it was a great experience that allowed him to spend a lot of time with his dad, who passed away last November. Apart from the 90 tons of concrete, the Golden Gate Bridge of Mulvane is built primarily out of recycled materials. 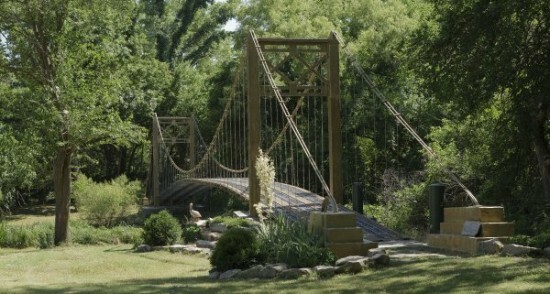 The Richardsons used part of an old wooden bridge for the towers, cables from an old oil rig, and suspender cables salvaged from an old Boeing aircraft. ”It was all handmade, hand dug,” Larry says. ”We backpacked supplies across, and built a crane to stand the towers up. It all went pretty smoothly, although a few times we went, ‘Uh-oh!’” The retired postman estimates he only spent around $5,000 building his backyard replica, while the original construction cost $35 million. 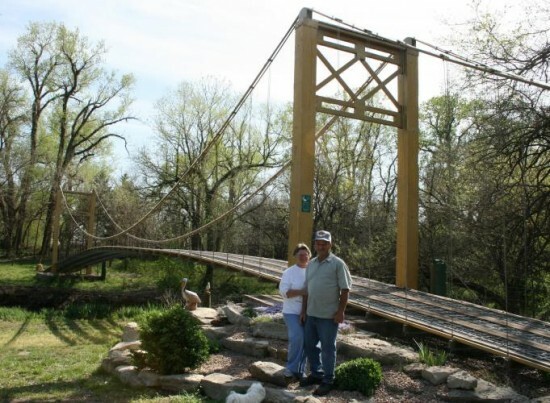 The backyard model has become one of Kansas’ most popular roadside attractions, and Larry and Barbara Richardson are happy whenever they get visitors. ”That’s the best thing about it,” they say. “We’ve met more nice people. If they come out, it seems like it’s because life interests them, and they’re interesting people.” One couple even used the small bridge as the location for a marriage proposal, and turning the twinkling lights Larry installed, at dusk just made it more romantic.